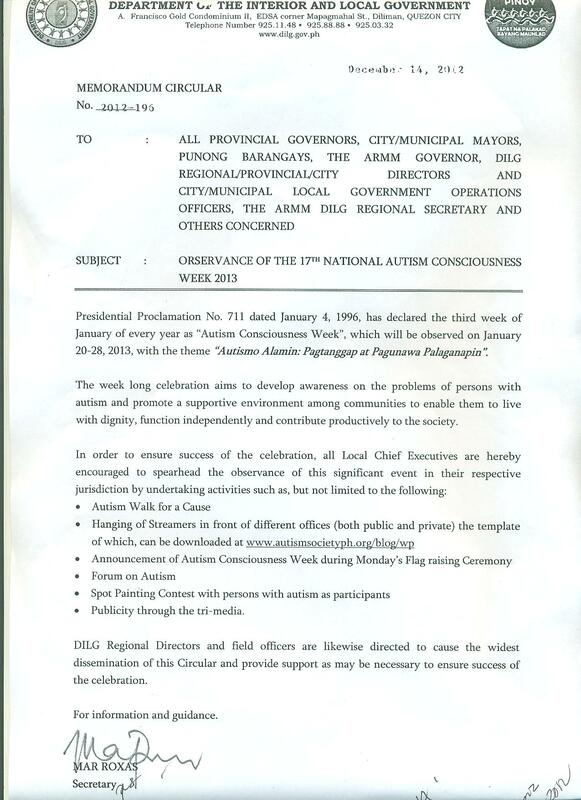 The Department of Interior and Local Government (DILG), the Department of Education (DepEd) and the Department of Social Welfare and Development-National Capital Region (DSWD-NCR) had issued their respective Memorandum Circular in support of the 17th National Autism Consciousness Week celebration. The DILG and DSWD, two of the government agencies participating as members of the National Working Committee of the 17th National Autism Week Celebration, enjoins their nationwide branches to support this annual observance. The DILG Circular signed by Secretary Mar Roxas enjoins all Local Government Units (LGUs) to conduct and support activities relative to the celebration. DepEd has requested all schools especially the Special Education Centers to organize activities in their schools, to support and join activities organized by other groups like Autism Society Philippines in their respective localities. The DSWD-NCR, the Chair of the Regional Council On Disability Affairs were the Autism Society Philippines sits as the vice chair, also gave its support by issuing its own circular to the different local DSWD Offices to also conduct their own activities and to join the activities of the NACW in Metro Manila.